Something you should know about me: I am a little bit of a hoarder. Not a big league hoarder with stacks of boxes, clothes, chicken bones and Safeway bags filled with collectable dust bunnies. I am actually reasonably organized, but I also happen to have MPI statements dating back several years. My MPI renewal also happens to more-or-less correspond with the announcement that MPI premiums are increasing close to 1% next year, which means that I happened to have my new statement right in front of me waiting to be paid when I heard the story on TV about the premiums. An increase of any kind is not something to be happy about, but while premiums are sneaking back up after MPI had it’s knuckles rapped by the Public Utilities Board a few years ago for having them too high, there is another component to your vehicle insurance bill that doesn’t get the same sort of scrutiny: Registration fees. The vehicle registration fee on my newest statement is $154. This represents a full 15.7% of the cost of insuring my car. Going back to the earliest MPI statement that I have in my little semi-organized hoard of papers — 2002 — the registration fee was $58. That amount made up only 5.9% of the total cost of registering the very same car. What does this tell us? Well first of all, I need a new car. But also: the increase in registration costs is completely out of line with inflation. Why are the vehicle registration charges increases so rapidly? Why did they increase from $119 in 2012 to $154 in 2013? These fees should reflect the costs of processing your registration. I do not believe they were intended to be used as a general revenue source or a back-door tax. Has the process of registering vehicles become 166% less efficient over the past 12 years? Has MPI been doling out 10% salary increases to its staff? Or … is this fee being abused as a revenue source for MPI or for the provincial government? I haven’t had a chance to verify this, but a source on twitter claimed that the fees are set in the provincial budget, which would explain a lot. I may, if I have time, dig around a bit and update this post with my findings, so stay tuned. I did the checking when those fees jumped over 20% one year. 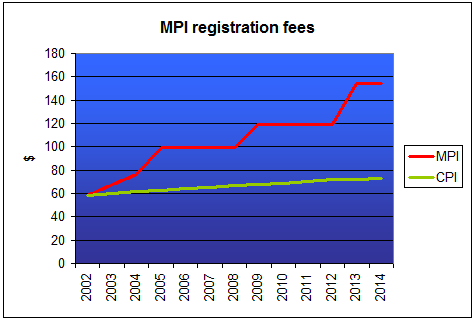 The registration fee doesn’t go to MPI at all. It goes to the Dept. of Transportation ( still that today? ) and is supposedly being used for road and highway projects. So yes, it’s another NDP tax. That insatiable hoard on Broadway can’t get enough of your money and this is a sneaky way to do it. I think I meant horde, not hoard. Thanks for the info. I had suspected something was up. And what’s with all the different spellings of words in this English language? Who designed this thing? than that, this is excellent blog. A great read. I will definitely be back. that make the greatest changes. Thanks for sharing! It’s actually very difficult in this busy life to listen news on Television, therefore I just use the web for that purpose, and obtain the latest news. I do consider all of the concepts you’ve introduced in your post.